New corneal transplant techniques give surgeons several options to use depending upon the specific disease. However, each type of graft is vulnerable in different ways to rejection and failure. This article discusses how to recognize graft rejections so they can be treated as early as possible. Corneal transplant success rates have increased dramatically in the past few years. Better outcomes are the upshot of new surgical techniques that only target diseased corneal layers while sparing healthy tissue. The result is increased safety, speedier recovery and better outcomes than traditional full-thickness grafts. However, despite numerous advancements, graft rejection and failure still remain a threat. Each year about 100,000 corneal transplants are performed world-wide and over 40,000 of those are done in the United States. Episodes of graft rejection occur in up to 20% of cases and can happen more than once. As we manage transplant patients post-operatively, it is important to recognize signs and symptoms of graft rejection and failure. Fortunately, over 75% of rejection episodes can be halted and reversed with timely care and medication. Graft rejection is an immunologic response by the host in which there is evidence of white blood cells attacking the graft. These white cells manifest clinically as subepithelial or stromal infiltrates or endothelial keratic precipitates. Early failure, also called primary failure, results from insufficient endothelium pump function in the donor tissue. 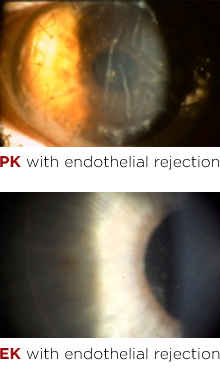 In early failure of a full-thickness graft, or penetrating keratoplasty (PK), the graft is immediately non-clearing and remains so for two months. With endothelial keratoplasty (EK), the transplanted tissue fails to adhere to host tissue despite repeated attempts at positioning. Late failure is a more general term describing any graft that no longer functions as intended. This can be caused by scarring, irregular astigmatism, endothelial pump failure, or significant corneal vascularization. A well-known feature of the normal cornea is its weak immune response compared to other barrier tissues. For example, skin graft rejection is almost 100% if the donor tissue is not human leukocyte antigen (HLA) matched to the host. However, even though donor corneas are not routinely HLA matched to the host, the rejection rate of full-thickness corneal transplants is only about 20%. Diminished immunity is the result of immune cells residing primarily in the blood stream and lymph channels—relatively distant from the avascular cornea. This has a functional purpose. It minimizes scar-inducing response in the cornea that can reduce visual clarity. Foreign antigens in corneal transplant tissue are not likely to be detected by the immune system; therefore the incidence of rejection is relatively low. The cornea’s immune-privileged nature makes rejection less likely in the quiet eye. However, vascular permeability from inflammation increases the odds that enough immune cells will leave circulation, reach the donor tissue and initiate rejection. To minimize this risk, any significant ocular inflammation must be treated rapidly and effectively. Because collagen fibers do not carry HLA antigens, they do not stimulate rejection. However, HLA antigens are on the surface of the epithelial cells, the stromal keratocytes, and the endothelial cells. Consequently, rejection can occur at the epithelium, stroma and endothelium. The corneal epithelium can reject early in the post-op course. It manifests as grey edematous epithelium advancing from the periphery towards the center. Except in cases of keratolimbal allograft, epithelial cells are universally replaced by host cells in the early post-op period. As a result of limbal migration, epithelial rejection episodes are not a source of graft failure. Stromal keratocytes are also potential sources for rejection. The fate of donor keratocytes is not entirely clear, but it is thought that donor cells may persist for years or even indefinitely after transplantation. Corneal keratocyte rejection typically presents as subepithelial/anterior stromal infiltrates. Immunologic attack of epithelial cells and stromal keratocytes does not typically result in graft failure. However, it represents sensitization of the body to the graft and should be aggressively treated. Otherwise, endothelial rejection may occur that could lead to graft failure. Rejection at the endothelial layer is the greatest concern. As the endothelial pump function is stressed, corneal edema may develop. Rejection typically manifests as keratic precipitates (KP) with or without stromal edema. Less commonly, acute stromal edema may be present without KP. Left untreated, rejection often leads to graft failure through collapse of the endothelial pump function. Penetrating Keratoplasty (PK) is the traditional full-thickness transplant in which the entire central cornea is replaced. Consequently, PK grafts have the highest potential for rejection. Deep Anterior Lamellar Keratoplasty (DALK) is a useful but technically difficult surgery to treat corneal disease anterior to the endothelium. It is indicated for keratectasias, scarring and corneal degenerations. With DALK, all anterior tissue is resected and replaced with a full-thickness graft, minus Descemet’s membrane and endothelium. Graft complications are similar to those with PK, except that the host endothelium remains intact. So, rejection of that layer is not possible. Epithelial and stromal rejections are possible but do not lead to graft failure when treated effectively. Graft failure can occur, however, in severe or inadequately treated cases that result in significant vascularization or scarring. I have heard it stated, in no uncertain terms, that EK grafts cannot reject because there is no adjacent vasculature to carry immune cells to the transplant. However, the rejection rate is approximately 16%. Several groups of cells that reside elsewhere in the anterior chamber (eg. trabecular meshwork and iris) have been implicated in endothelial rejection. Endothelial grafts shed antigens that can stimulate rejection. Episodes manifest similarly to PK with KP and/or corneal edema. While rejection of EK grafts can lead to failure, it is usually not as aggressive as PK graft rejection. Each corneal transplant technique has unique strengths and limitations. All can suffer rejection and failure. But presentation, intensity and location will vary. Knowing what to look for with each graft technique will simplify your clinical decision process. Good understanding of the layers at risk with each procedure will also increase the quality of your post-op care. A comfortable working knowledge of corneal transplant techniques increases confidence in patient care and counseling. If you have questions or would like to become more familiar with certain procedures, feel free to call any of our optometric physicians.